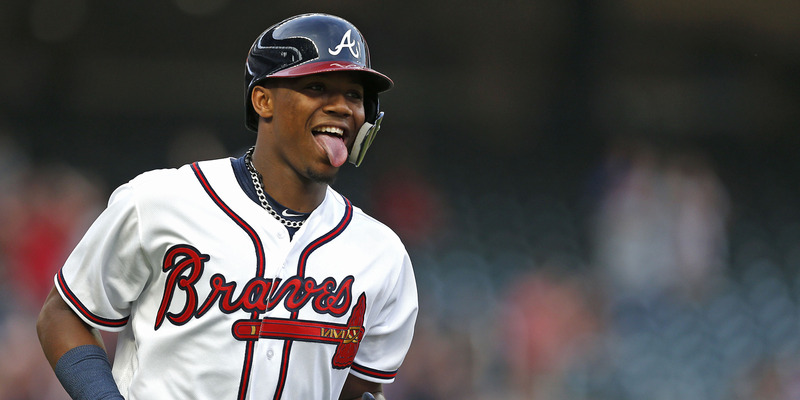 Mike Zarrilli/Getty ImagesRonald Acuña Jr. is the hottest hitter in baseball, and at 20 years old, already has his name on lists next to the likes of Willie Mays. Braves rookie Ronald Acuna Jr. is on one of the most impressive streaks the baseball world has ever seen from a young player. Acuna has hit eight home runs in eight games for the Braves, helping to shoot Atlanta into first place in the NL East. The hot streak has caught the attention of the baseball world, and earned Acuna high praise from coaches and teammates. Braves rookie Ronald Acuna Jr. is on an absolute tear. On Monday, he became just the fourth player in MLB history to hit leadoff home runs in both halves of a double-header, helping the Braves to win both games over the Miami Marlins. Those two shots gave Acuna six home runs in the Braves past seven games, and on Tuesday, he did it once again, adding a phenomenal bat flip to mark the occasion. That swing made it three straight games that Acuna had hit a leadoff bomb, and five straight game he’d hit one out of the park with his first official at-bat, putting the 20-year-old slugger in elite company, as statistician Ryan M. Spaeder noted. #Braves Ronald Acuna is the first player to homer in his first official at-bat in five straight games since Willie Mays from June 21-25, 1954. Between Aaron Judge and Cody Bellinger’s breakout 2017 season, it may feel like rookie hot streaks are almost the norm in baseball now, but the run Acuna is currently on is truly unprecedented – his hot streak has set new record marks as the youngest player to ever accomplish all sorts of homer-related feats. The unthinkable streak has shot Acuna into the race for NL Rookie of the Year, although it’s likely Nationals slugger Juan Soto still holds pole position. Still, Acuna’s run is earning high praise from his coaches and teammates. Acuna’s hot streak came at a perfect time, helping the Braves take over first place in the NL East from the Philadelphia Phillies heading into the home stretch of the season, and put a comfortable gap between themselves and the flailing Washington Nationals. With 44 games remaining, Atlanta will have to hope he can keep up the success as the team looks to win the division for the first time since 2013.